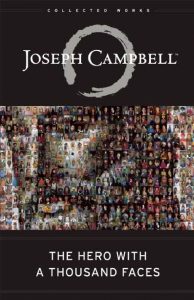 With the 1949 publication of The Hero with a Thousand Faces, Joseph Campbell accomplished the rare task of uniting wisdom with mainstream interest, presenting foundational patterns of human experience through the archetypal content embedded in the myths. His insights have inspired readers, writers, filmmakers, psychologists, mythologists and many others to better recognize and navigate the mysterious frontier where outer reality and the human psyche converge. In honor of Campbell’s approaching birthday (March 26), I am happy to address the theme of celebration. However, rather than emphasizing the many obvious and wonderful features that accompany celebration, I feel it is more valuable to address how our precious celebrations may be sustained. In the present age of instant information and immediate gratification, awareness and respect for sustainability has diminished. Foundations have been sundered from the very things they support, buried under an ever-expanding breadth of volume. When asked what new myths may be arising, Campbell remarked that the times are changing too rapidly to sustain new myths, implying that a deceleration or stabilization is needed to establish foundations capable of supporting new mythologies. Similarly, celebration requires a solid foundation if it is to be sustained. And so I ask, how may one keep the nymphs around a little longer—or even permanently? How may one sustain the celebration, albeit in a slightly more subdued capacity, from which fuller joys may rise? 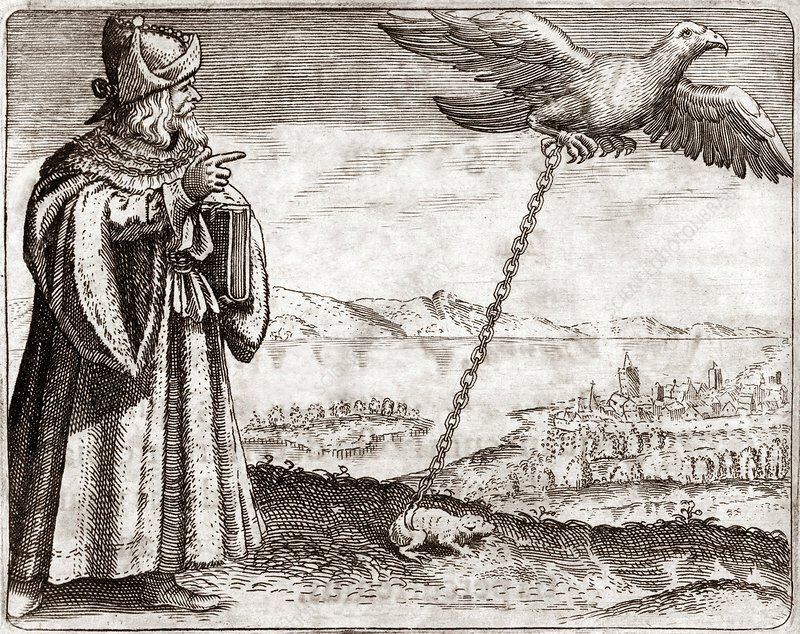 To do so, I turn to “The Emblem of Avicenna,” an alchemical image depicting a bird in flight chained to a strange-looking earthbound creature that vaguely resembles a toad. The image addresses the balancing of opposites and the consequent tension that necessarily accompanies such acts. Although tension is generally deemed undesirable, it is important to recognize that even joy and pleasure have their tension. High magnitudes of healthy tension yield excitement and ecstasy, low magnitudes yield calmness, contentedness, and so on. In short, tension is the force (or, at least, the effect of the force) that holds any two bodies or phenomena in relationship with each other. For example, the Earth and the Moon are held in relationship through a subtle tension called gravity. Similarly, contrasting emotions or experiences are held together in an emotional or psychological tension. When the balanced tension of distinct phenomena is finely tuned, the result is resonance—a harmonious vitality and aliveness that moves the soul. 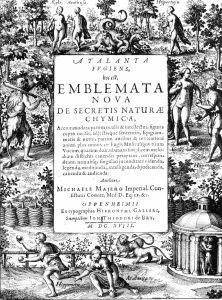 The frontispiece of Atalanta Fugiens, Michael Meier’s 1618 treatise on alchemical symbols. We live in the midst of joy and sorrow, pleasure and pain, sun and rain. It is the task of the individual to strive for balance within them. Sometimes the balance comes effortlessly, sometimes not. In his Atalanta Fugiens (1617), Michael Maier presents the Emblem of Avicenna with the caption “fixing the volatile,” indicating that it is our responsibility (and privilege) to consciously implement a “fixing” force—a balance—in the field of the opposites. Celebration is volatile in that it is ebullient, effervescent, and exceedingly “up”—a leap into the air and again into the air, wholly disregarding the bothersome intrusions of gravity and logic for as long as it may. Nonetheless, the inevitable fall, the grounding aspect, is hardly a loss. For the likes of patience and thoughtfulness live there. As do empathy, compassion, presence and, dare I say, wisdom. Speaking of which, consider the maxim “No mud, no lotus.” The roots exist in darkness, the flower thrives in light. And their synergy sustains the entire organism. Similarly, sorrow adds depth to joy, summer slowly builds out of winter, the fixed serves to launch the flight and in so doing becomes the sustainer of flight. 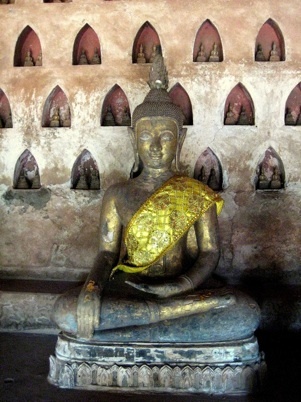 The Buddha touching the earth (Sanskrit: Bhumisparsha Mudrā). When the Buddha had risen to an exceptionally high level of consciousness, his elevated condition naturally attracted its opposite in the form of the terrible demon Māra, who came to thwart the Buddha’s pending enlightenment. But the Buddha achieved his victory by simply “moving his hand to touch the ground with his fingertips, and thus bid the goddess Earth bear witness to his right to be sitting where he was” (The Hero with a Thousand Faces, 30). This literally grounding act act of literal grounding invited a meeting between the high and the low. And their union was expressed in the silent proclamation of his (and indeed every being’s) supreme and irrefutable status, balanced within and between the opposites—a status which celebrates the self and cannot be expressed more thoroughly or more accurately than in the two simple words: I am. Craig Deininger is a mythologist, poet, Jungian scholar, and construction worker. In addition to Jungian Psychology, he has taught writing, creative writing, and various literature courses at several colleges and universities. 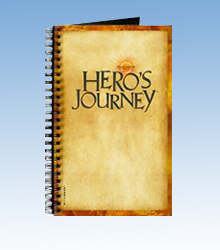 He has been a part of the Joseph Campbell Mythological RoundTable ® group in Ojai, California since 2011, where he presents primarily on Imagination, Mythology, and Alchemy.